We provide our service dogs and cover the necessary expenses that are entailed in enabling our clients to receive the help they need at no charge to them. 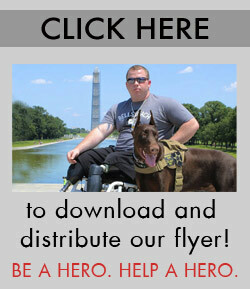 The overall cost of providing one of our highly trained service dogs to a disabled client exceeds $10.000.00. We do not ask for donations or funding from our clients. We believe it is for us, and those who support the mission to give back, to pass it on. We are in need of funds to rebuild, expand, acquire new kennels, to cover training costs and overhead associated with maintaining our dogs and enabling the instruction for our clients. We welcome the sponsorship of business’s and other organizations that may share the spirit of our mission. Those who donate the cost of providing a dog, (or higher), will be featured on our site and be able to advertise the fact that they are active supporters of the Argus Service Dog Organization.